YRF’s forthcoming Diwali extravaganza Thugs of Hindostan will be the biggest release that Bollywood has ever seen. 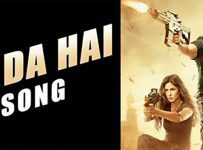 This mega-action film has achieved a casting coup in the history of Bollywood by bringing together two of the biggest icons of Hindi cinema Amitabh Bachchan and Aamir Khan for the first time. Today, YRF unveiled the logo of this action entertainer and announced the release date as November 8th, a national holiday. Ranveer, Deepika may marry this year!